Mortgage rates were down this week, averaging 4.09 percent for a 30-year, fixed-rate loan, down from 4.12 percent last week. Last year at this time, the rate was 3.81 percent, according to Freddie Mac . What’s going on? 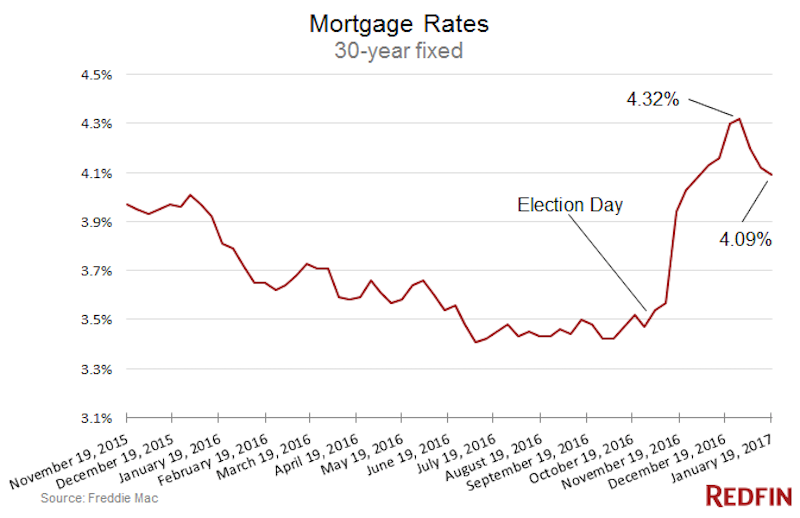 Immediately after Donald Trump’s unexpected victory in the presidential election, mortgage rates jumped, with the 30-year fixed climbing as high as 4.32 percent in late December, after being as low as 3.47 in late October. The rate jumped based on a combination of solid economic growth indicators and optimistic Wall Street sentiment regarding the Trump administration’s pledges to further stoke economic growth and cut taxes. Regardless of the positive sentiment from investors, some observers worried mortgage rates would continue to rise, overly burdening homebuyers. In fact, that hasn’t been the case. Since the turn of the year, mortgage rates have dipped. Redfin forecasts rates won’t average above 4.3% for 2017, in large part because the government is a major investor in the mortgage space. So Mortgage Rates Will Be Steady? That said, it is possible rates will float upwards again, but if they do, it’ll likely be based on good economic conditions. “Rising rates are associated with an improving economy, more jobs, greater growth and higher wages. That should take the sting off a small uptick,” said Redfin chief economist Nela Richardson. Even if rates creep up over the coming year, they’ll still be at bargain-basement levels. 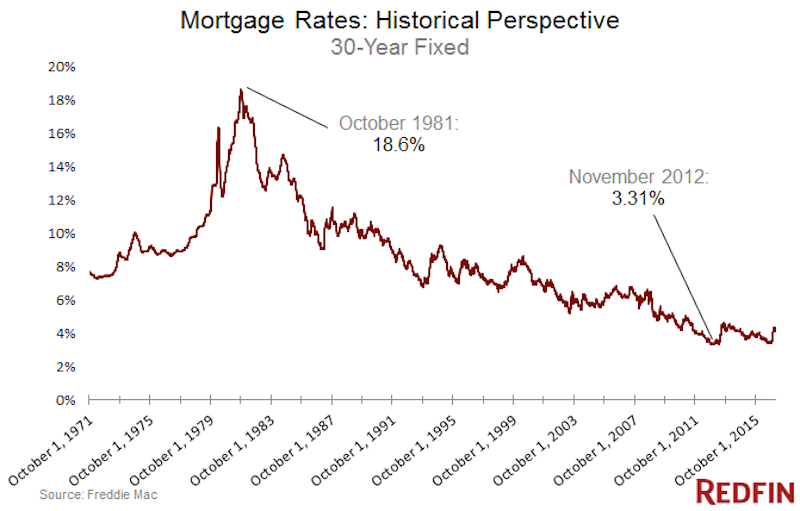 In other words, buyers in the 1980s and 1990s would kill for the current rates. Breaking out the differences in dollars by decade is instructive. Currently, the mortgage rate is 4.09 percent, and the most recent median home price is $267,600. That means that the mortgage payment for a typical homebuyer (assuming 20 percent down, 1.25% in property taxes and $70/month in homeowner’s insurance) currently sits at $1,354 per month. Twenty years ago this week, the mortgage rate was 7.87 percent, and so the same-priced home, with the same parameters, would have cost $1,872 per month. Thirty years ago, the rate was a whopping 9.21 percent, and so the same-priced home, with the same parameters, would have cost $2,075 per month. So, it’s all a matter of perspective.